I hear stories of so many people who have followed diets, lost some weight temporarily (or often lost no weight), but ultimately didn't get the long lasting transformation they expected. The diet industry pisses me off! 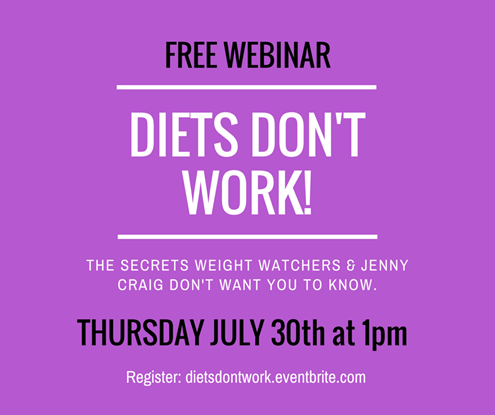 Register for this free webinar. You can share questions and comments with me and other participants during the webinar via a live chat box on the event page. This is my very first webinar. I'm so excited to connect with you in this way! If you can't attend live, no problem. Register and I'll send you a link to watch the replay. Already registered? Great! Now, tell your friends. Click here to tweet about it.